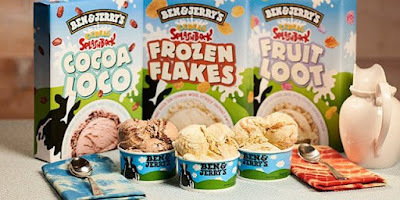 Ben & Jerry's releases new Cereal Splashbacks (a play on "throwbacks") ice cream flavors inspired by some classic children's cereals. You won't find them in the supermarket though; they're only available at Ben & Jerry's Scoop Shops. - Fruit Loot - Cereal milk ice cream with a crisp fruity cereal swirl. - Frozen Flakes - Cereal milk ice cream with a crisp cereal swirl. - Cocoa Loco - Chocolate cereal milk ice cream with a crisp chocolate cereal swirl. 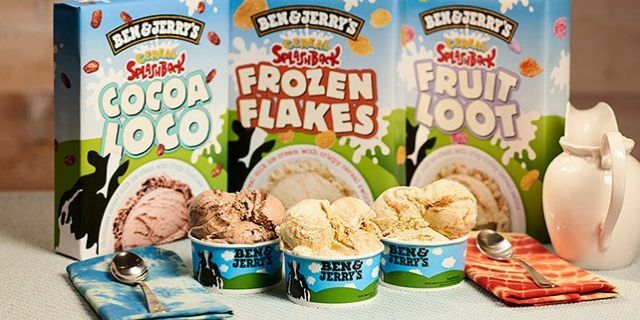 If the names sound a little familiar, they seem to be Ben & Jerry's take on Fruit Loops, Frosted Flakes, and Cocoa Puffs (they look like Cocoa Pebbles but then there's the classic Cocoa Puff slogan--"I'm cuckoo for Cocoa Puffs"). Cereal Splashbacks won't only be confined to the US either; coming this September they'll launch in New Zealand, Singapore, and Australia.